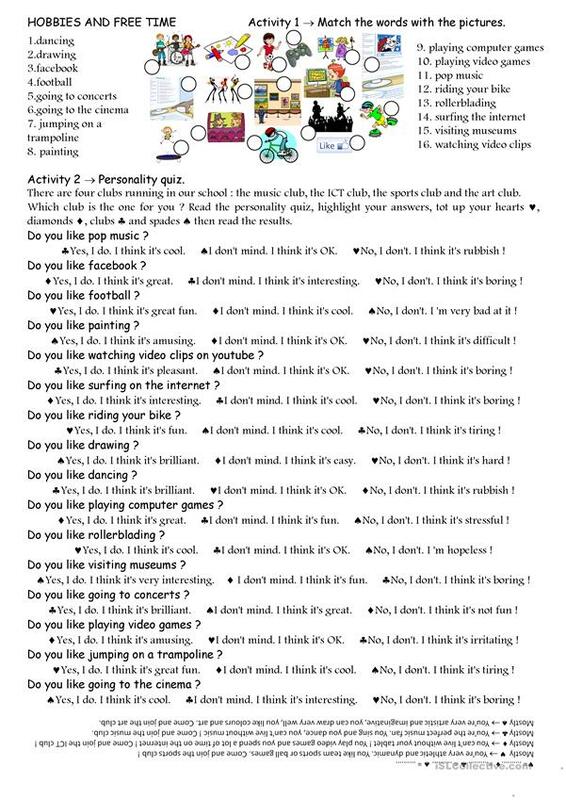 This worksheet is about hobbies, free time and clubs running in a school. Students learn vocabulary about hobbies, indoors and outdoors activities, after school activities. Then they have to do a personality quiz to find out which club is the one for them : the music club, the ICT club, the sports club or the art club. Students tot up their hearts, diamonds, clubs and spades then they read the results and find out which club is the one for them. This downloadable teaching material is a great resource for high school students at Pre-intermediate (A2) level. It is great for practising Present simple tense in English, and is a valuable material for working on your pupils' Speaking and Reading skills. It features the topic and words of Free time, leisure activities.